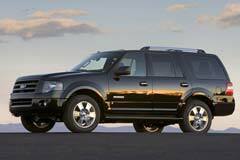 The Ford Expedition, which was first introduced for the model year of 1997, is Ford's full-size SUV offering. It has seating for up to nine passengers. Replacing the older Ford Bronco, it is heavily based on the popular F-150 half-ton pickup truck; electronics and transmissions are shared with the pickup models. Until 2005, the larger of the two Expedition models was sold as the Excursion, but it was then replaced by the newer EL/Max option. The Expedition has been a hit, with over 1.5 million sold. Expeditions built up until 2009 were made in Michigan, but the newest third generation vehicles are built in Kentucky. This will be succeeded by a fourth generation around 2015. The first two generations of Expeditions boast either a 4.6-liter or a 5.4-liter V8 Triton engine, but the smaller option was dropped for the car's third iteration. The earlier vehicles also have four-speed automatic transmissions, which have been updated to six-speed units in the newer models. 2015 Ford Expedition EL Platinum 2015 Ford Expedtion Platinum EL, 4x4, Ecoboost, Nav, Cam, Roof, 8 Passenger! !